This is iOS E commerce template which includes more pages. All pages have eye catching attractive design. 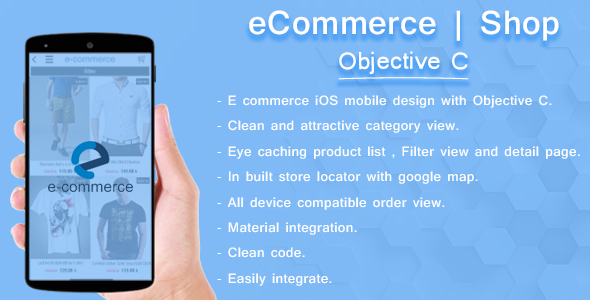 E commerce iOS mobile design with Objective C.
Clean and attractive category view. Eye caching product list , Filter view and detail page. In built store locator with google map. All device compatible order view. This is a objective C iOS E-Commerce template. In this app you will get many pages which have clean and Clear design and code. All pages written below. This application is compatible with iPhone and iPad. The main benefit of this app is API/json. All datas working with an API/json. So you can manage your data easily with an API/json. You must need knowledge of objective C.
In order to modify the app you need to have knowledge in Xcode. For Reskin and upload to the App store you can contact me anytime. Just in $50.